Justin Bell takes this 5.0L Mustang police car out for a training session with the Oxnard Police Department. The Result: a pair of shredded rear tires and one soon-to-be revoked driver’s license. Mustangs take on many different looks and roles these days. Some are outfitted for the lead role in a movie, while others get the full-on custom treatment for SEMA. Even the police are getting in with the Mustang culture–and not just in Dubai–by using a customized Mustang as a police cruiser that generates community awareness. The program is called DRAGG, or Drag Racing Against Gangs and Graffiti and the sergeant giving driving instructions in this video is one of the officers who helped create the DRAGG program. While I’m sure they aren’t teaching smokey burnouts in public parking lots like Justin Bell of Motor Trend Magazine is doing in the video, they are steering kids away from the hard lessons learned on the streets and into the automotive world by introducing them to the fun and exciting job opportunities the car industry has to offer. And flashy Ford Mustang is the perfect way to get their attention, especially when you have a 426HP 5.0L V8 under the hood. While the DRAGG team was putting up with Motor Trend’s punishing performance driving, there was a serious message to be heard: If you engage kids with something they’ll be genuinely interested in (like a bada** Mustang ripping around a bunch of cones), they might let you in on what gets their gears turning, which is step one in leading them to a more positive path in life. 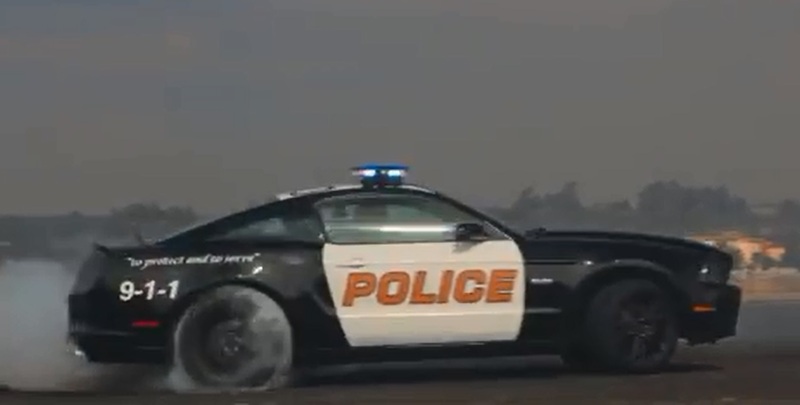 All seriousness aside, it might be time for another awesome Ford Mustang police chase commercial, this time with Justin Bell driving the getaway car, all while trying to outrun DRAGG’s own community-tuned Mustang cop car.